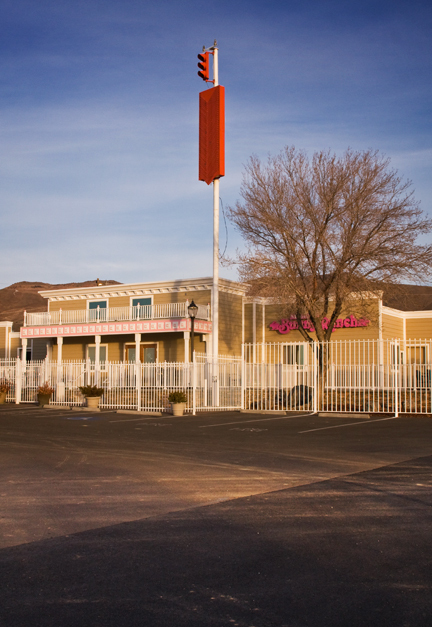 Above is a legal brothel outside Carson City, a few hours east of San Francisco (and to answer your question, no I didn't). But this photo gives me a chance to talk about Belle Cora, San Francisco's most famous Madam. Belle was the innocent daughter of a prominent Baltimore minister who cast her out when she fell to the wiles of a worldly suitor and became pregnant. With no options she turned to a life of sin to support her child. At least that was her story - in reality Clara Belle Ryan was born to non-ministerial parents and ran off to New Orleans where she met and married a Natchez gambler named Charles Cora. The two decided to try their luck in Gold Rush San Francisco, arriving December 28, 1849 aboard the side-wheeler California. After making a small fortune gambling throughout the Gold Country the couple set up a brothel on Pike Street (now Waverly Place). The opulent building was described as rivaling the finest mansions in San Francisco. Belle sent out engraved and embossed invitations to to all the principal gentlemen of the city, including the mayor, aldermen, judges, members of legislature, and even clergy. Soon Belle's brothel was the most popular in the city, due in no small part to its exotic French girls. While San Francisco's gentlemen may have appreciated Belle's charms, their wives did not. During a 1855 play at the American Theatre, the wife of U.S. Marshall, General William Richardson demanded that the Coras be ejected from theater's balcony. When the manager refused, the Richardsons left instead. Days later, Charles Cora and Richardson met on the street, exchanged angry words, and Cora shot the U.S. Marshall, killing him. In the middle of the trial, Cora and another murderer, James Casey were dragged from their cells and hanged by a mob of vigilantes. Belle was pressed by both her friends and enemies to leave town but she refused. According to popular lore, Belle went into deep mourning, sold her brothel, and donated her fortune to charity. But again Belle's real story was not quite so redeeming. Until her death, Belle Cora defiantly wore her fanciest, gaudiest gowns and rode in her ornate carriage with her troupe of girls through the streets of San Francisco.